Ziena is an award-winning brand, communications and reputation management strategist, and has supported some of New Zealand’s biggest businesses to grow their reputations and revenues. She has advised Ministers, senior officials, and C-suite executives. Before joining SenateSHJ, Ziena spent 10 years in Asia, in the roles of Regional Director – South & South East Asia for Education New Zealand, as New Zealand Trade Commissioner to Singapore, and as Head of North Asia Marketing and Communications for New Zealand Trade and Enterprise. A hallmark of Ziena’s campaigns is leveraging advocates and the targeted use of social media. She has received several international awards including the Public Affairs Asia Gold Standard for Country/Trade Promotion and Asia Pacific PRWeek awards. Earlier in her career she was recognised as New Zealand’s Young PR Practitioner of the Year. Ziena is passionate about diversity and inclusion and has presented and advised in this field, including publishing internationally in the book Workforce Diversity: Global Perspectives. 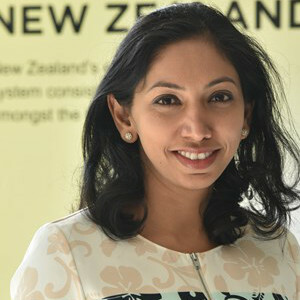 She is an Advisory Board Member for New Zealand Asian Leaders; an Established Member of Super Diverse Women; and a Member of the New Zealand Institute of Directors. She is also one of only a few Kiwis to have been selected as an Asia Society Asia 21 Young Leader.